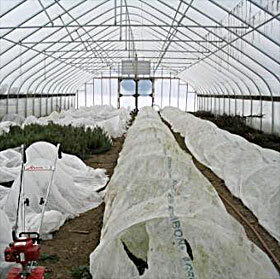 Rosemary overwintering in high tunnel at Kingbird Farm, Berkshire, N.Y.
To extend the season for annual herbs, such as basil, cilantro, marjoram, arugula, parsley. 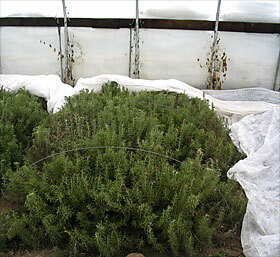 Right: Rosemary overwintering in high tunnel at Kingbird Farm, Berkshire, N.Y. View more images or read report about high-tunnel herb project. The information below was gathered from Michael and Karma Glos, Kingbird Farm, Berkshire, N.Y. Read report of their Northeast SARE-funded project. If you are only using the tunnel to extend the season for annual herbs, it does not need to be strong enough to withstand winter snow loads. If you are using the tunnel to overwinter herbs, choose one that will withstand snow load. Gable vents (in addition to roll-up sides) are important for venting during warm spells in the winter. A higher, taller structure holds heat collected during the day from solar gain better than a shorter, narrower one. Direct seed cool-season annual herbs such as arugula, dill, and cilantro in early April, for harvests in mid-May. Later sequential plantings can be direct-seeded outside. Plant annual heat-loving herbs like basil in late April for harvest in late May and early June. Cover with row cover within the tunnel to protect from late spring frosts–basil does not tolerate any frost. Sequential plantings of basil in the high tunnel can provide a continuous supply all summer. Tender herbs will overwinter better if the plants are larger and more established. Plant them in the tunnel in the spring if you can so they are well-established when winter comes. For extra protection overwinter, cover the plants with row cover. Soil can actually be cooler under mulch, delaying growth in spring. To overwinter Zone 7 herbs (able to withstand winter lows of 0°F to 10°F) at Kingbird Farm, Berkshire, N.Y., Michael and Karma Glos, use a 30- by 96-foot, gothic-style high tunnel with an inflated double-poly roof.During one particularly cold week-long winter spell where the temperature dropped to -22°F outside, inside the tunnel it was 3°F. Under the row cover it was 15°F, and in the soil it was 33°F. The greenhouse alone gave a 25°F gain in temperature, and with row cover it was 38°F warmer than outside.The Glos’s found that covering the ground with straw mulch actually keeps the soil cooler than using mulch and row cover, or row cover alone. The best overwintering and fastest early spring growth of rosemary has been with bare ground under the plants and row cover over them. (They used Agribon 19, 0.55 ounce per square yard.) Straw-covered plants stayed colder and got moldy.Not all perennial herbs overwintered and grew better in the tunnel than outside. But herbs adapted to hot, dry Mediterranean climates do much better in the tunnel. Rosemary ‘Arp’ (Zone 7): First harvests in early April. French tarragon (Zone 4): First harvest in April, slows down in the heat of August and dies back to the ground over winter. Purple sage (Zone 4): Harvest fall growth through winter. New-growth harvest starts in April. Pineapple mint (Zone 6): First harvest in April. Plants die back over winter. Mulching slows spring growth. Oregano thyme (Zone 4): First harvest in late April. Catnip (Zone 4-5): Thrives in the house producing multiple cuttings during the season. Lavener: ‘Hidcote’ (Zone 4) and ‘Lady’ (Zone 6) bloomed twice a year, June and September. These perennial herbs grew just as well outside as inside the tunnel, and suffered severe hopper burn inside: winter thyme, garden sage, greek oregano, lemon balm, anise hyssop, spear mint, apple mint, and orange mint. See Kingbird Farm’s SARE report for more information. Herbs with woody stems should not be cut too harshly during harvest. For sage, rosemary, and lavender, you can safely cut 25% of leafy growth and 10% of woody growth at any one time. Some herbs can be cut back more aggressively, almost to the ground, like oregano and thyme. Herbs, like all plants, slow down growth with shortening day lengths. Because of short days combined with cold temperatures, herbs do not really grow from the end of October until the beginning of March. The leaves you see at the end of October are the ‘stock’ you have to work with until early spring. Some time in November (after Thanksgiving sales), herbs such as oregano, lavender, and thyme can be renovated, cut almost to the ground. Others will dye back to the ground on their own (tarragon, mint). Overwatering will lead to root-rot disease problems. Many of these herbs are adapted to do better in a dry (though not desert) environment, so water sparingly. Though most herbs do not need high fertility and can actually have better flavor under lower fertility conditions, heavy cutting will require the plant to grow a lot of leaves over the season, and nutrients should not be limiting. Kingbird farm uses 10 to 15 gallons of very rich compost on a 50-square-foot bed in the early spring. The compost is fine screened so it falls down through the herb plants before the flush of spring growth. Japanese beetles are a major problem on basil both inside and outside the tunnel. Several of the perennial herbs get severe hopper burn (from leaf hopper insects feeding) inside the tunnel. Four-lined plant bugs can be devastating to herbs, since their feeding can make almost every leaf on the plant unsalable. Green-leafed sage and mint are particularly susceptible. Feeding damage results in small (about 2mm) brown circles on the leaves. Look for the nymphs (similar to red aphids) so you can detect the problem early. Mint (and other herbs) can also get a severe rust infection.